A classic fruit crisp done right is three things: simple, healthy, and delicious. 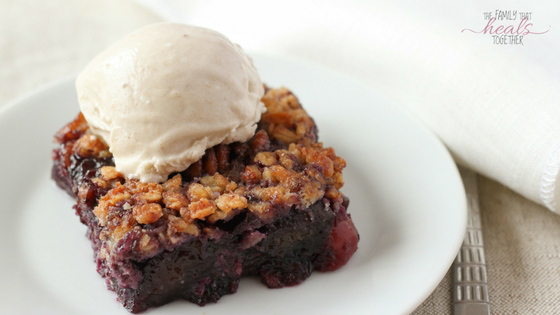 Below, you’ll find this gluten free fruit crisp recipe satisfies all three requirements! I’ve always had a thing for fruity desserts: pies, cobblers, and my mother in law’s dump cake. When I set out to make this gluten-free fruit crisp, I had that dump cake in mind, without any actual knowledge of how she made it, and only a vague recollection of what might’ve been in it. So, as with most of my recipes, I threw some stuff together and saw what happened. After later googling the difference between fruit crisps, cobbler, dump cakes, and crumbles, I decided this wasn’t really a dump cake, but was more of a crisp. No bother, my family pronounced it the “best dessert” I’ve ever made. Not bad for something super simple that I threw together in a few minutes! Classic crisps have oats in them, and on a whim, I had bought some canned fruit and gluten-free granola, not totally sure how I was going to put them together. As I wrote about when I shared that I haven’t been strict paleo for some time, I’m ok with incorporating some gluten-free grains now and again. Oats are definitely not something I eat every day, as they can be inflammatory and difficult to digest, but I’m ok with having oats occasionally and don’t seem to react to them so long as I purchase ones specifically labelled gluten-free. That’s the thing about oats. Though they are naturally gluten-free, they tend to be heavily contaminated, and I find I react to ones not specifically labelled gluten-free. The catch is, it’s hard to find ones that are both gluten-free and organic. Another reason to keep oat consumption to a minimum, because avoiding pesticides and herbicides like glyphosate is really important to me. So, now that we’ve gotten that out of the way, if you can’t do oats, you can always use a paleo granola. 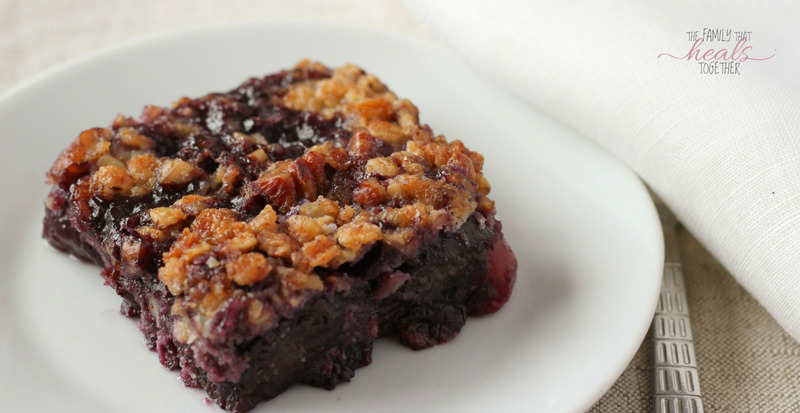 If you want to make this fruit crisp paleo, you can just sub the granola for a paleo option. Because there are so many varieties of paleo granolas out there these days, the results will vary. Note: I went out of my way to choose a honey-sweetened granola so that this recipe doesn’t contain refined white sugar. Be mindful when looking at ingredient labels if that’s important to you. Another good option is using homemade granola, whether it contains oats or is paleo-friendly, but keep it simple and use minimal ingredients. While I am in a season where I’ve relied more on convenience foods than I’m used to (hello TWO MOVES IN ONE YEAR), I’m still picky about what my family eats. I’ve already detailed how to use quality granola for this recipe, but in addition, the recipe calls for canned fruit. I used organic canned fruit with no sugar added. To be clear: I don’t think using canned foods is the best choice, and I definitely don’t make it a habit, but it is nice on occasion. However, cans typically contain a chemical called BPA, a known hormone disruptor, and while some quality manufacturers (particularly those with an organic label) are moving to BPA-free can linings, they likely still contain similar chemicals to prevent the cans from rusting. Bottom line: canned foods are not something you should be using every day. If you want to skip the canned fruit, you can use fresh or frozen, but will need to cook it all at once with the maple syrup and gelatin, and adjust the time appropriately until it has all boiled down to a thick, chunky fruit syrup. Finally, as I’ve shared before, butter is my preferred cooking fat. Our family tolerates it well, it’s chock full of vitamin K (be sure to get grassfed butter! ), and the flavor can’t be beat. However, if you don’t tolerate butter, you can substitute palm shortening or ghee in this recipe. Now that you know the ends and outs of how and why and what kind of ingredients to use, I’m guessing you want what you came here for: the gluten free fruit crisp recipe, and I’m happy to deliver! Pour cans of fruit (minus cherry juice) into 9 x 13 dish and set aside. Add blueberry mixture to fruit mixture in dish and stir well until combined evenly. In a medium bowl, combine butter, remaining syrup, and flour and use pastry cutter or fork to press until a gooey dough forms. Add granola and stir well. Drop clumps of dough over the fruit mixture and spread it out evenly. This looks so delicious! Love the combination of fruit and that topping looks amazing!